"I miss my father terribly... He was everything to me." 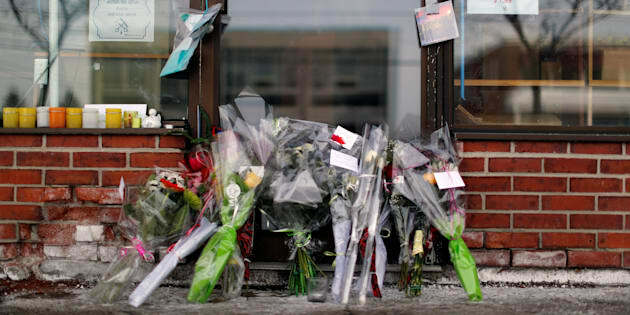 Flowers are pictured beside the grocery store owned by Azzeddine Soufiane, a victim of the fatal shooting at the Quebec Islamic Cultural Centre, in Quebec City, on Jan. 31, 2017. QUEBEC — The 14-year-old daughter of the man considered a hero after he died trying to stop the Quebec City mosque shooter gave moving testimony Thursday about how much she misses her father. In between tears, the teenager spoke on behalf of herself and her family and about how Azzedine Soufiane's death has left a giant void in their lives. "I miss my father terribly," said the girl, whose name is under a publication ban. "He was everything to me." The girl's mother and many others in the courtroom cried throughout her testimony, which was part of the sentencing arguments hearing for Alexandre Bissonnette, who pleaded guilty to murdering Soufiane and five other Muslim worshippers on Jan. 29, 2017. Police interview Alexandre Bissonnette on Jan. 30, 2017, the day after the mosque attacks, in this still from an interrogation video shown by the Crown to the sentencing hearings in Quebec City in this handout photo. Witnesses to the mosque shooting said Soufiane charged the gunman, trying to disarm him and save others, only to be shot dead on the carpet. The girl said in the days following the shooting she was living in a fog, telling herself her father was still alive. But then, "I saw the casket," she said. "And I really saw that my father was dead." "I am proud of my dad, of his actions," she said. "He was the best father, the best man ... Why? Why did this man (Bissonnette) attack innocent people?" Even Quebec Superior Court Justice Francois Huot described her father as a hero. Huot addressed the girl directly, telling her he never had the privilege to meet Soufiane, but that, due to his actions, "he was a giant. Your father was a hero." The Crown completed presenting its evidence Thursday. Bissonnette's defence team is scheduled to begin its arguments Monday. Huot has to determine how much time must be served before the eligibility kicks in — which in this case could be as much as 150 years. Quebec Islamic Cultural Centre president Boufeldja Benabdallah speaks at a news conference on March 28, 2018 at the hall of justice in Quebec City. Earlier on Thursday, the head of the Quebec City mosque where the six men were gunned down addressed the author of the rampage directly and pointedly asked him why he committed the crimes. "Why? Why?," said Boufeldja Benabdallah, his eyes trained on killer Bissonnette. Evidence photo of a bullet hole found at the scene of a shooting at a Quebec City mosque released Thursday at the sentencing hearing for Alexandre Bissonnette.